We designed and developed a business management portal for Earth Solutions Group. The software combines website management, online site administration as well as their office management into the one solution - accessible from computer and mobile devices. "Our software isn't working - what can we do?" Earth Solutions Group were operating 3 different websites for the same process - a website; an online process management solution; and an online questionnaire. The prior setup was not meeting their requirements and resulting in repetition across the three websites. At the same time, the workflows were not suited to how they ran a business - so it took a significant time between a transaction occurring on site and that transaction being sent to the customer. DCODE GROUP re-developed their suite of tools into one platform. The process started by identifying the systems, policies and procedures of ESG, then working to design a data source that would be flexible with their data and reporting requirements. Once the data structures were ready; when then designed and developed a platform for ESG combinging - their website, their on-site management system (used on tablet at each site), their online customer-facing survey and a management solution (accessible from the cloud) tieing all their data, reporting and approvals into one process. The system has allowed us to extend/enhance functionality with the help of ESG and now also integrates directly with their Xero platform. Clients are now Invoiced the Next Day! As a result of the changes implemented, all major stakeholders are now accessing the same platform - clients, operators, site staff, managers and accounts. This meant that data is shared real-time across these users and can be collated and reviewed in a timely fashion. 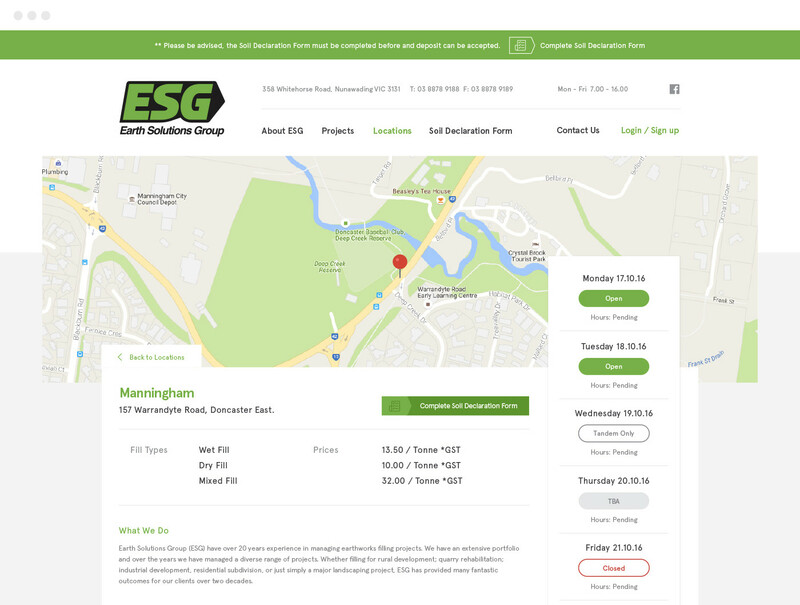 While the solution provided a steamlined process, improved website and accessibility at all locations - the biggest benefit to ESG was the ability to see performance in real time and to accuratly monitor client usage of site facilities. At the same time, the dramatic decrease in days to invoice has been an enourmous benefit to the business. We worked hard to understand the requirements of ESG and how best to develop a solution that would meet their current requriements, while being flexible enough for future changes.